Small shapes of thin egg dough sheets, perfect to make soups, broths or vegetable pureed soups, especially during wintertime when it’s cold outside and all you wish to have is a hot dish like the ones that used to be prepared in the past. Capelli d’Angelo (Italian for “Angel’s hair”) is one of the classic types of the line Pastine, perfect to make vegetable soups, more full-bodied condiments like Rustichella d’Abruzzo “Pomodoro e Basilico” sauce with a bit of Rustichella Extra Virgin Olive Oil, or with a delicate scampi broth with a bit of minced parsley and chives. Cooking time: 5 minutes. 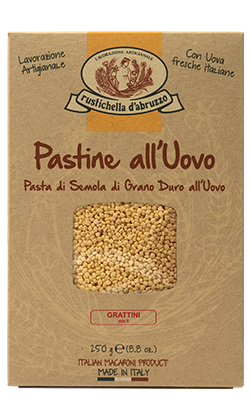 Grattini all’Uovo is a small-sized grain-shaped type of egg pasta, perfect for vegetable soups or legume soups. We recommend it with a delicate leek and potato soup or with a simple vegetable broth with a bit of Rustichella d’Abruzzo Extra Virgin Olive Oil. Cooking time: 5 minutes. Quadrucci all’Uovo tells the history of the most genuine side of Abruzzo region, when grandmothers used to do homemade fresh egg pasta, giving it the shape of tiny squares. The classic recipe is with a delicate vegetable broth with a bit of Rustichella d’Abruzzo Extra Virgin Olive Oil. 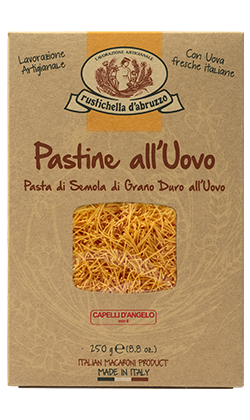 It can also combine with more full-bodied condiments like a vegetable pureed soup or a “Pomodoro e Basilico” soup, seasoned with a bit of Rustichella d’Abruzzo PrimoGrano INTOSSO monocultivar Extra Virgin Olive Oil. Cooking time: 5 minutes.